At 8.30, the last meeting with our first batch of entrepreneurs began. For the first time we held the meeting in the Youth House. We rigged up a computer and a projector, and on the wall, Samuel and Muditu had put up a white sheet to use as a screen. Then, we went through each of the entrepreneurs´ financial plans and everybody could follow the exposition on the screen. It is important to know the strengths and weaknesses of the other members in the group. In collaboration with each entrepreneur we had given the plans the finishing touches during the week. Bernt went through the liquidity budgets and pointed at some examples to show how it might be done. Halfway through his talk, the projector went out due to power failure. It was a pity, but no surprise. We are used to it by now. Power failure is unfortunately a daily phenomenon, and sometimes it occurs several times a day. I am writing this by the light of a torch and luckily, the computer runs on battery. The remaining task for us concerning this first group of entrepreneurs is the payment of the loans, and that will take place during next week. The bank needed a few days to cash the cheque. We hope it will work out fine, but you never know. When they have received the loans they will begin their investments. They are eager to get going. Now, we hope that the experiences and the know-how we have shared with them will be turned into practice with good results. Then, it is important that the chairperson of the group gathers the group once a month and report through our website. We hope that the pressure of the group on its members plus the obligation to report to us, will have a beneficial effect on the entrepreneurs. We asked Julienne what she thinks about it, whether she believes they will succeed. She told us she had actually talked to them about this, and she thinks they will be successful because they take the entrepreneurial role seriously. Julienne, our interpreter, has been a pastor for 37 years, and manager of the CEC Women Movement for 27 years. Her husband is a pastor as well, and he has been director of CEC for 12 years. She was the first female pastor in Congo, and has extensive experiences of development programmes. She has told us about several programmes, with plenty of money involved, that haven’t returned any lasting results. The only ones that benefitted from the programmes were the administrators – they had good wages as long as the programmes lasted. When the programme was over, there was nothing to show for it. When Julienne was 18 years old in 1967, she came to Sweden to study. She learnt Swedish during one semester at Södra Vätterbygdens Folk High-school. Then, she continued her studies at the Convenant Church Theological Seminary for three years. Her future husband came to Sweden two years after her, and they married on Lidingö in 1969. Arvid Stenström officiated at the wedding. After finishing her degree, they worked in Kinshasa for four years. Then, they went to France for further studies for four and a half year. This time, she studied sociology and community planning. After the stay in France they have remained faithful to Congo. Two years before pensioning, she was removed from office as manager of the CEC Women Movement against her will. She had become dangerous to the executive management, as she had access to too much information. She saw deficiencies and she wanted a change. Because of this, she worked again as a pastor in a congregation in Luozi the last years before pensioning. In Congo, women retire with pension at the age of 60. She came to a church that didn´t have a roof, just four walls. 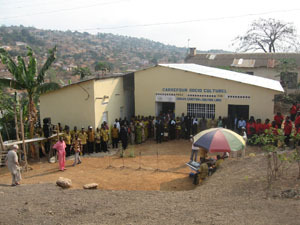 The congregation sat under the open sky during service. But with the help of God and people, as she put it, they soon had a roof on the church. In a few weeks, a German journalist who’s going to write a book about her, is coming to Congo to interview her. Bernt and I probably haven´t realized what a capacity Julienne really is, what experience and knowledge she possesses. So far, we have understood that she knows the Church and Congo by heart, and that she truly understands the Congolese society. Bernt and I had a meeting this week with Julienne and Marie France, who is also a pastor. We asked them whether they would like to become course-leaders for future entrepreneurs. Both of them told us that they believe in our concept and our planning, and that they agree to become course-leaders for Matadi Support Group. Marie has participated in our first entrepreneurial course and she speaks English. Intressant att läsa om det ni gör. Verkar bra att ni hittat två kvinnor ni både kan prata engelska med och som kan delge er hur människorna och samhället fungerar. Bra jobbat! I kväll var det ett inslag på Agenda med Hans Rosling som finns på youtube. Han visar med statistik hur världens fattiga länder är starkt på gång. Dock Ligger Kongo och Afganistan stilla och långt efter. Så det behövs entusiaster! I Sverige är det nu töväder! Du måste hälsa till Julienne från mig! En fantastisk kvinna som jag ger all min respekt och beundran. Vi gick Missionsskolan på Lidingå tillsammans, dock inte i samma klass. Vi har även träffats ute i Kongo, då jag varit på besök i Kinshasa och hon har besökt mig i sverige också. Minns inte om det var här i Fristad eller hemma i Dalstorp? Bengt påstår att han också träffat henne, så då måste det ha varit här i fristad. vi hade en samling i M-kyrkan. Vilken lycka om ni får med dessa två kvinnor i ert projekt! Brain Wave Vibration, Ilchi Lee, 2008, ISBN 9781935127000.